On this fateful day 100 years ago, India’s heart, the colour of its blood changed. 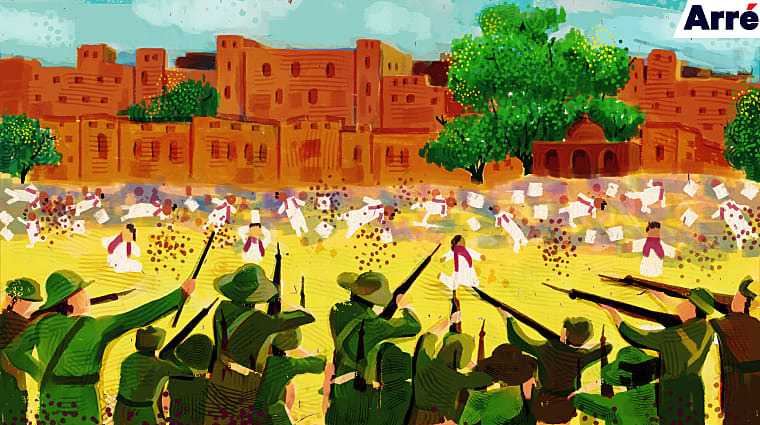 The Jallianwala Bagh massacre is a stain on the mottled history of the heinous British Raj. So can Theresa May’s almost-apology accomplish anything if Britain continues whitewashing its imperialistic past? Komagata Maru is a blot on the history of Canada, built on the backs of immigrants, many of them Indian. Just the way the Jallianwala Bagh massacre of 1919 is a stain on the mottled history of the admittedly heinous British Raj in India. It is not hard to see why May’s half-apology for a historical blunder committed by her country seems inadequate. It has tested the patience and politeness of everyone from leaders from May’s Conservative Party to Labour Party leader Jeremy Corbyn to the feisty Punjab chief minister, Amarinder Singh. But barring the acknowledgement of a wrong, we need to ask what it is that such apologies accomplish in the first place. Political apologies, as the scientist Rhoda Howard-Hassmann puts it, “really started trending in the last 15 years, to the point that some people think it’s just getting ridiculous.” Trudeau made four political apologies in 2016 itself. A number of countries involved in World War 2, including Japan and Germany have apologised. Here in India, we have had viral videos of a very eloquent Shashi Tharoor demanding reparations for the loot and abuse brought on by 300 years of colonial rule. It offered the world a chance to guffaw at a heady mix of white privilege and white guilt. There have been instances in the world where reparations have been made in terms of compensation as well. When Ronald Reagan apologised in 1988 to American-Japanese citizens who were interned in WW2 camps he announced a payment of 20,000 USD to each surviving victim. But while Tharoor has in his literature thrown around ecstatic figures of money that British rule cost India – not to mention the loss of life, dignity and will – even he has suggested that it is the symbolism of the act that matters, not the ballpark figure. To that effect, apologies can become just that: Symbolic, and therefore empty gestures or mere gimmicks. When I met the British Historian David Gilmour a couple of months ago, we had a brief chat about Tharoor’s proposed ideas. “I don’t think apologies will do anyone any good, especially if they are insincere. The people apologising do not understand what they are apologising for or know it either. I think there needs to be sincere acknowledgement, there needs to be an acceptance of the things colonial rule led to, bad and good,” he’d said. Not many might agree with Gilmour, for this is as much an issue about national pride as it is about humanity, but he has a point. Most British citizens living today are not even aware of their country’s imperial past. The whitewashing of Britain’s imperial conquests and crimes continues unabated in its school curricula, resulting in a generation of people who are neither aware nor fit to contemplate the atrocities that their ancestors were responsible for. Rather than offer lifeless, insincere apologies, it would mean a lot more if the Kingdom owns up to its history of oppression and pillage. Though Trudeau’s apology was welcomed by most in India, people elsewhere questioned the consistency with which he has apologised for various things. It offered the world a chance to guffaw at a heady mix of white privilege and white guilt. Rather than hand the Western world this narrative of philanthropic politics, India would perhaps be better served by commemorating the memory of victims of colonial rule (perhaps all of us) without stretching the sense of victimhood. That is not to say we whitewash history as well, but only attempt to write a future in which we do not feel like the casualty of a car crash that we might never mentally escape. On that fateful day 100 years ago, India’s heart, the colour of its blood changed. Freedom, in more ways than one, became inevitable. Even the maniacal General Dyer, the man responsible for ordering the shooting of unarmed Indians in Amritsar, died questioning his sanity on his deathbed. But it doesn’t help heal the wounds he inflicted. Neither will apologies. Rather than demand a token “sorry for your loss”, we should instead ask for the whitewashing of Britain’s imperial past to be stopped – it is as much a history of them, as it is of us.